I loved it when my mum made gingerbread cake, as the rich scent of it baking had us all anticipating its delicious and distinctive flavour. 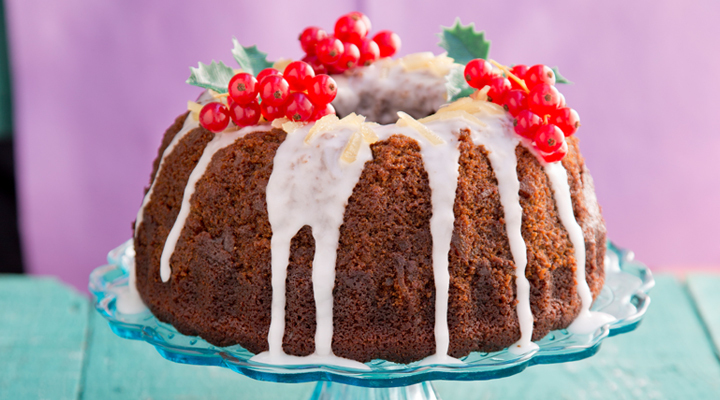 This is a traditional gingerbread recipe, but baked in a Bundt tin for a more festive touch. If you don’t have a Bundt tin, you can bake this cake in a 23cm square tin, but keep an eye on the cooking time as it may vary slightly. 1. Preheat the oven to 170°C/gas mark 3. Grease a 23cm Bundt tin really well with butter and set aside on a baking sheet. 2. Place the butter, sugar, golden syrup and treacle in a medium pan set over a low heat and stir until everything has melted together. Remove from the heat, stir in the milk and leave to cool. 3. Mix the flour and spices together in a large bowl. Beat the eggs lightly in a small bowl. Finely chop two balls of stem ginger and stir them into the eggs. Pour this into the flour, followed by the cooled butter and sugar mixture. Mix until well combined. Pour into the prepared tin and level the surface with the back of a spoon. 4. Bake for 1 hour. When cooked, the cake should be risen and springy to the touch and a skewer inserted into the centre should come out clean. Remove and set aside to cool completely in the tin before turning out. If a Bundt cake is turned out too soon, lots of it may remain in the tin, so it’s best to be patient and wait until it’s completely cool. 5. Once you’ve turned out the cooled cake, drizzle over the ginger syrup, if using, and cut the remaining piece of stem ginger into thin matchsticks. Blend the icing sugar in a medium bowl with 3 tablespoons of water to make a smooth, slightly runny glaze. Working quickly, stirring it to prevent it from forming a crust, spoon it over the cake and spread with the back of the spoon to encourage it to run down the sides. If the icing glaze is too thick, add a little more water to loosen it. If it’s too thin, blend in a little more icing sugar. 6. Immediately sprinkle the stem ginger over the top to stick. Drape the bunches of redcurrants on top and serve.